Spending a full week in Southern France’s Languedoc wine region was full of highlights. 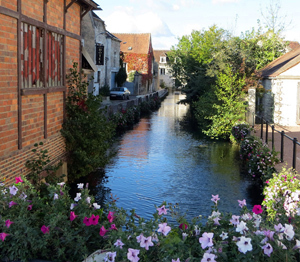 The week built to a full day out in the Languedoc countryside that really capped the week off. I returned to Indiana Friday evening and have been recovering from the long flights. I have a lot of material to wade through. But I’m going to post some notes and build some albums as I got along. Thierry Julien giving us a taste of Janiny wines. Thursday was highlighted by a morning with Jacques Frelin who is a major figure in organic wine exporting to the U.S. His family is widely credited for starting the organic wine movement and starting the AIVB, the organic wine organization that sponsors the Millesime Bio wine fair. Jacques took me to the 3 S bottling plant that serves many wineries in southern France and then on to Pezenas. 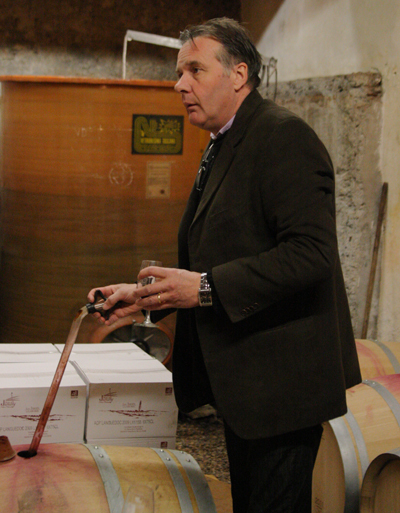 Thierry Julien’s family also has a long history in organic vineyard practices. Julien is the current AIVB president. The two shared candid thoughts about the perception of organic wine in the U.S. and why there remains much confusion. Their remarks are quite interesting. I’ll be writing that story for Palate Press in coming weeks. But I have a lot of material I can use in the newspaper column and elsewhere. And I have a lot of material that will eventually get posted here. Here is a photo album built this morning from my Thursday in the Languedoc.